Celebrate Heart Health Month with the Cardio Protect Kit. 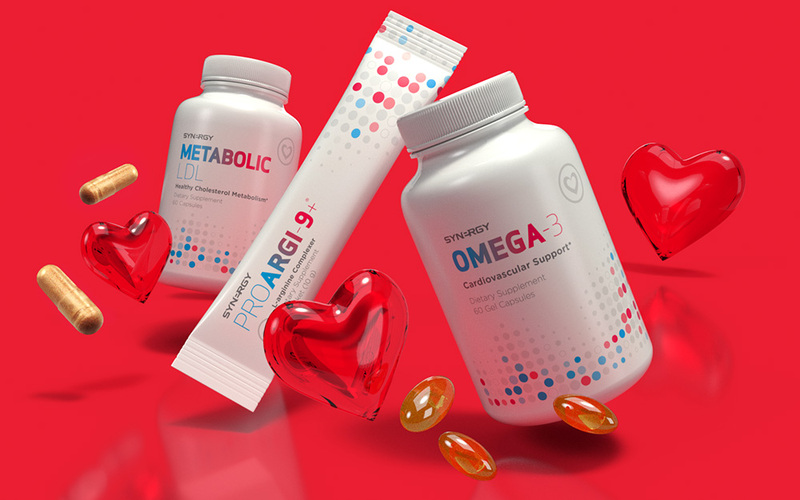 This kit delivers three of Synergy's most powerful formulas to support and protect your heart at a savings of over $50! Your heart is your body's hardest-working muscle, and deserves special care and attention. This powerful organ beats 100,000 times a day to pump 2,000 gallons of blood throughout the body. Poor heart function and circulation can cause many issues in your body. With the Cardio Protect Kit you can nourish your heart with clinically-studied, carefully-formulated products that will help you reach your full potential. Synergy's newest product, Metabolic LDL, contains a powerful main ingredient, Citrus bergamia Risso extract, and a proprietary blend of high-ORAC antioxidants that help to support total cholesterol and triglyceride levels, as well as blood sugar levels. Watch the Metabolic LDL video, HERE. Synergy's flagship product, ProArgi-9+, has been clinically-proven to increase nitric oxide production in the body, which is an essential amino acid that helps blood vessels relax, therefore, increasing circulation. Synergy products are based on science, research, and results, ensuring that they will undoubtedly work for you. The Hughes Center for Research and Innovation was designed with the goal to combat health mega-trends driven by poor diet and lifestyle choices through natural, nutritionally therapeutic products. Outfitted with state-of-the-art instrumentation, the Hughes Center is the hub of Synergy WorldWide's new product development. Utilizing the center's advanced technology, Hughes Center scientists verify the identity, purity, and potency of potential product ingredients and work to discover powerful and unique product formulations that support metabolic health through the gut microbiome. If a formulation proves itself in clinical studies, it joins Synergy's family of Elite Health products.